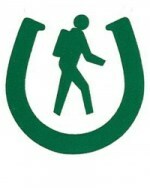 Horse Council BC is happy to provide HCBC Clubs, Affiliates, and Businesses with trail markers on request. The first 50 are free and any additional markers needed after that are $0.60 each plus shipping and tax. For Individual HCBC members and non-HCBC Clubs or Businesses, each marker is $0.60 plus shipping and tax. These markers are made of Styrene, are 4.5’x6″ in size, and can be nailed to trees along a trail using aluminum or nylon nails. There is room at the bottom to put directional arrows or trail names in permanent marker. To order trail markers, contact Jennifer Pipe via email at [email protected] or by phone at 604-856-4304 (toll free 1-800-345-8055) ext. 1009. As responsible horsemen and trail builders, it is important to remember that trees are living things and to respect them as such. Please avoid using steel nails, which can damage trees and cause disease, as well as create a serious hazard for anyone who may have to use a chainsaw on the tree in the future. Use aluminum or nylon nails, and let them stick out enough to allow the tree room to grow, or nail through a used aluminum horseshoe to ensure the sign stays attached as the tree expands.